I hope my Email find you all the best in your health. Does this library support to create folders ? Does this library support long file name support(Currently only 8 characters)? I shall be very thankful for your quick reply. If these two features are not supported, how can we update the library to support these features. Well that is simple. The key is... CS (chip select) pin - it must be on an unique (separated) pin. All (three) others can be shared with other SD cards (which also must be selected with a unique pin). This is how you connect multiple (even different) devices on a single SPI peripheral. This could be help full to me as i am doing a project which uses the SD card.Thank you very much for your support for guiding us. i use your code, and it works! but in 80% "SD card not detected.."
i cant understand why the controller so often didn't detect the Card. did you had the same problem? how to solve it. my powersupply did the mistake! 1000 times thank you from Germany! Dear Sir, Please give more insight into how to access the files in a memory card using a microcontroller and GLCD without using a Personal computer. e.g. If we interface a touchscreen to uC,in which format the data collected from touchscreen will be stored in memory card? If i want to display images from memory card how can i display them? Any suggestions on this project?Also share some useful links . Please reply as early as possible.Thanks in advance!! Hope so you are doing best of your health and job. I am facing a little problem with FAT32 library. When I use 1GB micro SD, files getting corrupt, e.g random folder of strange name appears when SD memory size exceeds by 300MB. Can U please help me out is this FAT32 issue OR some firmware modifications required..
Its urgent.. You help in this regards is highly appreciable..
but unable to use it with atmega 8 if u hab collective source like v2.2 , 2.3 , v2.4. plzz tell me or mail me at amargupta196@gmail.com. I implemented it on AtMega32, 2GB Transcend card. It says Unknown card ditected and FAT32 disabled. By which I am not able to create files. I was able to write data in raw format but not able read it. dear sir, unfortunately, we can't get through with your fat files on our sd card. pls help. How to learn write in C++ like you (uart function)? I appreciate your work because it is very useful to all embedded software developer. i want to write and read a single character in paritcular location. how do the process. please reply to my mail id(ravims3679@gmail.com). Thank you for creating such a wonderful blogging environment for learning & enhancing our skills in the field of Electronics. I am fresher to Microcontrollers. I am using yours concept to be implemented in my project. So I completed the whole circuit as u had given & then burned your code into Atmega32 uC. P.S. : Can u plz give me ur mail id where i can communicate with u, for my further queries ?? how could you use SD card in proteus? how could you use SD card on proteus? am from AMU ,we guys are doing the same project to log temperature data in micro sd card. i hv succesfully burned the code but in hyperterminal , am getting an error , it says "no card detected"
am using 2 gb microsd card that we normally use in our cell nowadays. could u plz help us out. wat are the possible sources of error. Good job! But i am not able to read file, could you help me? I am using arduino uno(which has the atmega328p) processor on it. I tried to change the registers especially in usart and I also changed the port alloction for spi to make this code compatible for atmega328p.but when I run the serial monitor I get the message:"SD card not detected". could you help me with that. FYI: I use a 8GB SD card. everything works fine but how to display free memory and total memory in version 2.4.1? from 10 May 2011. problem solved. Great project, however the schematics are wrong - CS pin of the sd card is said to be connected to PB1. But in the latest code it's connected to PB4 (SS). thanks for pointing that out. Though I've made both the options (PB1 or PB4) available in the sd_routines.h file, the latest code uses PB4 but the schematic shows PB1. I'll update the schematic. Thank you! Can i use this library for Atmega8? will i get the memory problem with atmega8 for this library? Sir, can you provide me the circuit for connecting sd card to hyperterminal using max232? Few small changes and it works great on MEGA164P. Atmel Studio 6.1. I tested your code and it works fine. I still have a little problem. It works with a Kingston 4GB SDHC card, but not with my card industrical Swissbit SD 2GB. I would like to make it work with Swissbit because it works between -40 ° C and +85 ° C.
give it a try with reduced SPI speed. Is it possible to use the code without any of the UART routines? 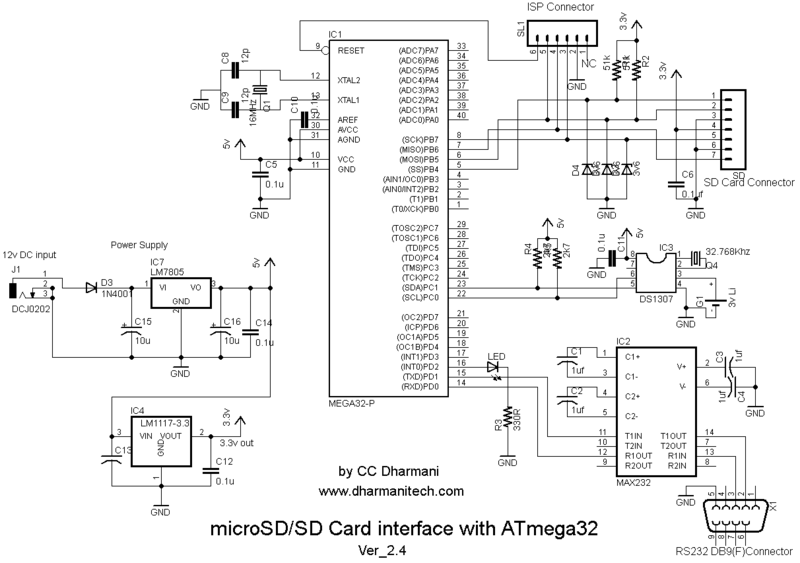 I want to interface microSD card with ATmega324. This project is absolutely great sir. I have created an data logger with ATMEGA16 runing 8MHz with Internal Osc. I try to record date and time first. I have tried to record it every second, for about 8 Hours. in "ddmmyyyy.TXT" format. But there is an error. the file is "corrupt", then I run "Check Disk". the file can opened in text editor, but some date/time was not recorded. So, can you give suggestion for me sir? This helped a lot in understanding the SPI Protocol,SD card and FAT32 functions. I am currently working on SDHC card implementation for ATmega16 development board. The clock frequency is 16MHz. Also i am using a SDHC Card of 4GB size by Lexar(my digital camera card). I have referred your code and tried to implement or my specification but it is not working properly. I am getting all the menu options but when i try to read/write, its not working properly. I cant able to read/write a text file...even read/write a single block sometime not working. also the file list and memory status not showing proper details every time. Please suggest me the required changes to do in your codes according to my specification. i want read file .txt in while(1) but at the second attempt read i get error File does not exist! and the program ends... How i fix it? How to modify the program to run the SLC? How can i write a table = "1234" to SD Card? Am quite new to this field. Can you please help me to calculate delay timing with respect to the clock frequency of the mc. I am using AVR Micro controller running at 1MHz interfacing Kingston SDHC 16GB card. the code resets after printing "High Capacity Card Detected!" Thanks once again for the work. This should be ok to implement on a ATxmega with a bit of tweaking hey? Will I be able to use the USB functionality on my xmega to communicate with the SD card via PC? i was traied the code but it shows sd card detected but not fat32. I tested it with 8 GB SDHC card. It works good. Thank you for your amazing job. I am using v2.4.1 but this bug still exists. I'd like to create a file, write some text in it and close with '~'. If i am right your text above is referring to this bug. [lines: 479-500. in the following code: http://pastebin.com/qD5SQysh] Could you please tell me how I could fix this code? I ported your AVR code for my MSP430G2553, but I found a problem with your code though. Product Manual SD Card v1.9 from Sandisk say that, SD Card shout remain Asserted though out the (Command + Data Packet + Response). But the Problem I with code is that When you call the function "SD_sendCommand" Its De-assert the CS line right after Successfully Command (R1 == 0), but i create a problem like for Data Packet , because the Assertion should be through a Command Sequence. I hope, i conveyed the the problem problem, but Please let me know if i misunderstood. Hey...Isn't is possible to avoid using those level shifting resistors just by using 3.3V all over the circuit? i mean atleast for the circuit without RTC, the atmega and the SD card can both be run at 3.3V? I am designing a Digital Audio Player using Atmega32.I am using a microSD card to store (.wav) files.The filesystem being used by the card is FAT32.So far I have successfully initialized the SD card and was able to read the Master Boot Record(MBR) using the code provided on this blog.Now I am stuck on how to read and play files from SD card.Is Anyone who can assist me on how I can translate this code in order to be able at least to read .WAV files. can I use LCD to display .txt from SD card? Get Electronic Components at www.componentbuy.com for best price.Order now and get huge selection on Electronic parts. Timer interrupt to avoid sd card driver function lock. why in your code we have not such a thing? Am able to read the text from the file up to EOF. I want to read an SD card text file one line at a time and process the data. If the line processed successfully, the same line want to be deleted. Each line consists of 47 bytes. How to read a single line (single record ) from the sd card? I m working with Fat32 in your for past 1 week. i tried all your guidelines(comments) to overcome "FAT 32 not found" error. Still i can't find solution. your blog is really helpful and great. I am getting stucked at a point in SDHC card interfacing with ATmega16 uC and I expecting help from your side. I am trying to interface an SDHC card from past few months but failed to succeed. now i am following your code to reprogram the MCU, I have written the program in my own way but by following your code for SDHC. 1.I am not able to initialize SDHC CARD. 2.command CMD0 and CMD8 is fine and giving idle state response. i have tested my card with Arduino and is working fine. it would be grateful if you help me by mail or on mobile. Thank for sharing, We can help you deal with Dharma Ransomware Incidents. We will consult you, negotiate with Dharma (.cezar Family), check if there are cheaper alternatives for finding the Dharma Decryptor, assist you in finding bitcoins and do the payment. Also we will help you use the tool for Dharma Decryption. Sir I'm using atmega 2560 development board and by using fat 32 file is read from sdhc card. How do i give data of file to 8 ohm 3 watt speaker? ?